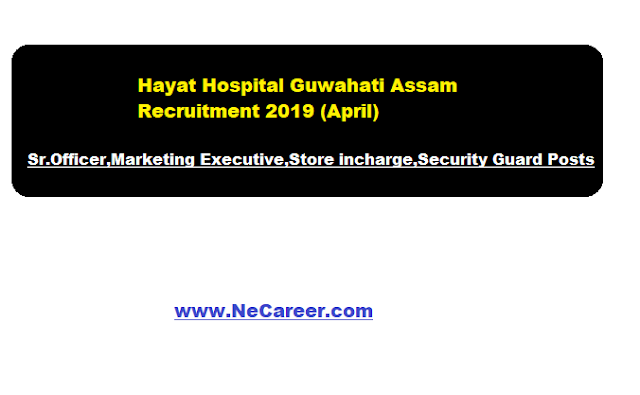 Hayat Hospital Guwahati Recruitment 2019 April | Various posts:- Welcome to North East India's No. 1 Job Portal NeCareer.com . Hayat Hospital, a 125 bedded, Multi-Super Speciality, tertiary care Hospital, scientifically planned and strategically located at Lal Ganesh, Odalbakra, Guwahati,Assam has issued a job notification in April 2019 for filling up various posts. Eligibility : Candidates must be Graduate in law with min 2-3 years of exp in handling legal matters in a corporate office or min 10-15 years experience in handling legal matters in court cases. Eligibility : Candidates must be MBA in Sales & Marketing with 2-3 years of experience in healthcare or pharma industry. Eligibility : Candidates must be Graduate with 8 -10 yrs Of experience in a hospital. Eligibility : Candidates must be B.Com/M.Com with 8 -10 yrs of experience in handling cash. Eligibility : Candidates must be B.Com with 1-3 years Of experience in handling cash. Eligibility : Candidates must be BBA/MBA/PG Diploma in hospital administration With 1-3 years of experience in hospital industry. Eligibility : Candidates must be HSLC Pass with 3-5 years of experience in related field with age group of 25-35 years.